Here are two easy and quick knits, perfect for last minute Christmas gifts. The design is unisex and reversible. Based on the Pythagorean pattern from BW2 pg 15, I find that this design plays on the eyes. Yes, I see triangles. But not only triangles. I also see triangles within triangles, squares, and diamonds (& parallelograms). And I even see windmills when I "block out" 4 out of 8 triangles within a large square. Although this pattern shares similarities in construction with the Asherton Reversible Scarf (and Asherton Hat), this is definitely a quicker knit due to not having the seed stitch patterning. I love seed stitch, however it can be a little tedious when you are doing a lot of it. 11/25/07 Note: Typo corrected on Rows 25 & 26. Thanks Sarah B for pointing this out. The top of the hat features tapering triangles. This hat is a ladies small size (it fits my head). You can change the size of your hat by casting on more or less stitches in multiples of 12. 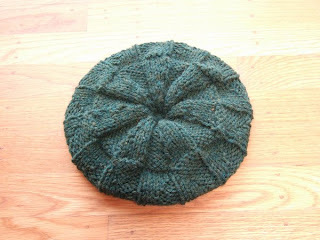 I made my hat on the short side with 1" ribbing (5 rounds for me). You can make yours a little longer by making the ribbing section longer, up to ~3" if you want it to be a fold-up brim. I chose not to knit a garter stitch border at the ends, I thought it looked much better when you jumped right into the pattern. The scarf is about 9 inches wide and 5.5 ft long. This scarf can be knit in almost any type of yarn, and gauge is not crucial. 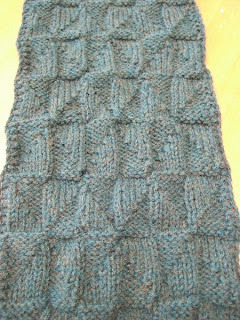 Adjust width of scarf by casting on more or less stitches in multiples of 12. Make sure to use a needle size appropriate for the type of yarn you use. Hate math, but love your pattern! Thanks! Just found this pattern and I'm so glad! My boyfriend is mad about triangles (especially Pascal's, but hey, it's a P right? :P). I think he'll really dig having a Pythagorian scarf! Yay for last minute birthday gifts! Oh and as I was doing the pattern I think I might have spotted a typo. In the scarf pattern on lines 25 & 26, is it supposed to be K2 *P1 K5 P5 K1* K2? I think the one I downloaded has one extra stitch. Thanks again for the fabulous pattern! Thank you for the pattern. 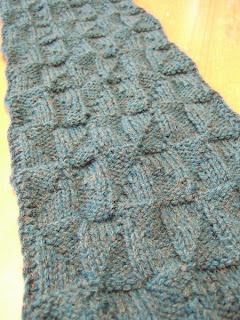 I am making this scarf now and it is lovely. I found this pattern a while ago and left it alone for a while, but I just got back to doing it a few days ago. This pattern is great for me, since I don't know too much about knitting.